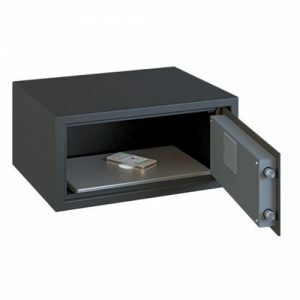 The Chubb Elements Air Safe is a cost effective compact safe for home and office, ideal for secure storage of cash, valuables, jewellery and electronics. The air range is available in two different sizes with a cash rating of £1,000 and valuables rating of £10,000. The range comes with a keylock as standard but is also available with an electronic lock. Steel 2mm body and 4mm solid steel door. Two 18mm diameter locking bolts. Conveniently sized for home and office security. Installs to floor or wall with fixing kit and instructions included. Available with key or electronic locking mechanism. Emergency key override facility for the electronic look should battery power ever fail. Patented ‘anti-bump’ technology which affords protection against impact attacks. Almost every person in the UK owns a held device, whether it’s a laptop, mobile phone or tablet. 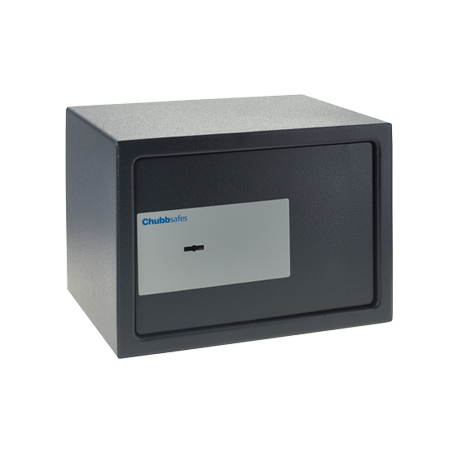 The laptop safe from the Chubb elements air range is a compact, robust safe designed for the secure storage of these kinds of devices. The Chubb air laptop safe is fitted as standard with a digital keypad locking mechanism, allowing users to set a 3-8 digit personal pin code. Digital keypad offering thousands of combinations. Compact and easily concealable, ideal for storing personal electronics and valuables. Supplied with emergency key override in the event of lock failure. Rear and base fixing points – supplied with fixing kit and instructions. Digital keypad runs with 4 x AA batteries.